After downing two bottles of the ED4OLO Cleansing Oil (yeah, that good, see past review here) over the fall semester, I nabbed de Mamiel’s Restorative Cleansing Balm in the 100ml size from Shen Beauty just before returning home from school for winter break. I hadn’t used a cleansing balm since my first #greenbeauty purchase two summers ago (which the skin, sadly, did not like), but a combination of an interest in Annee de Mamiel’s philosophy and background, Megan from Seed to Serum’s post on de Mamiel’s new Botaniques line, and the harsh winter had me itching for a second try at balms. And thank goodness because it was worth it. This is a beautiful, beautiful balm. Whether in the #polarvortex of the East Coast or in dry California, this remained buttery soft in spite of whatever weather. Thanks to a mix of flower essences and essential oils (Honey Myrtle, Fragonia, Chamomile, Rose Geranium), the balm smells beautifully floral–not in any way overwhelming, but truly restorative. It’s the best kind of calming scent to breathe in at the end of the day, almost making your insides feel more beautiful (I can just imagine my olfactory nerves turning to each other, “Hey, you’re looking good today!”). Paired with Aurelia’s softest of the softest bamboo muslin cloths (obsessed), this melts away all traces of makeup and grime from a dry face. I was always a bit heavy-handed since I loved smearing this balm over my face, but a marble-sized amount is a perfect amount to remove face and eye makeup. I used this as my first cleansing step to remove makeup pretty much exclusively for the whole (and very long) winter. While I always followed up with a second cleanser (YÜLI’s Halycon, R.L. Linden & Co.’s Bee Charmer), this always left my skin as the description puts it, “satin-soft, glowing, and calm”. When experimentations with other first step cleansers left my face less than happy, I always came back to this one. While of course this balm can’t yank a sweet bun from my fingers (over my dead body), I felt cleansing with this helped to improve the condition of my skin. No mysterious widespread breakouts–just happy, balanced, healthy, well-cleansed skin. The secret? A good amount of oils and butters topped with anti-all-the-bad-things and therapeutic manuka honey and skin-harmonizing probiotics (yes, even applied topically, not just orally!). The oil roster includes: fatty-acid rich but non-greasy camellia oil, anti-inflammatory and anti-bacterial calendula oil, deeply moisturizing and squalene-containing rice bran oil, restorative and healing borage oil, antioxidant-and-oleic-acid-rich marula oil, nourishing baobab oil, anti-inflammatory-and-ageing and moisturizing moringa oil, impurity-puller castor oil. If you thought the oils were beautiful, take a look at the butters: moisturizing kukui nut, vitamin-rich and moisturizing mango, fatty-acid rich and anti-bad murumuru (isn’t that the most fun name ever), and fat-rich and nourishing cocoa. tl;dr Beautiful, buttery-soft balm with moisturizing, cleansing, anti-bacterial/fungal/all-bad-things, anti-inflammatory ingredients that make you feel pretty. Oh, also removes makeup perfectly as the first step in cleansing. Would repurchase, but the weather’s finally looking up and I’ve got fresh bottles of ED4OLO to get through thanks to a past NMDL Friday Deal. 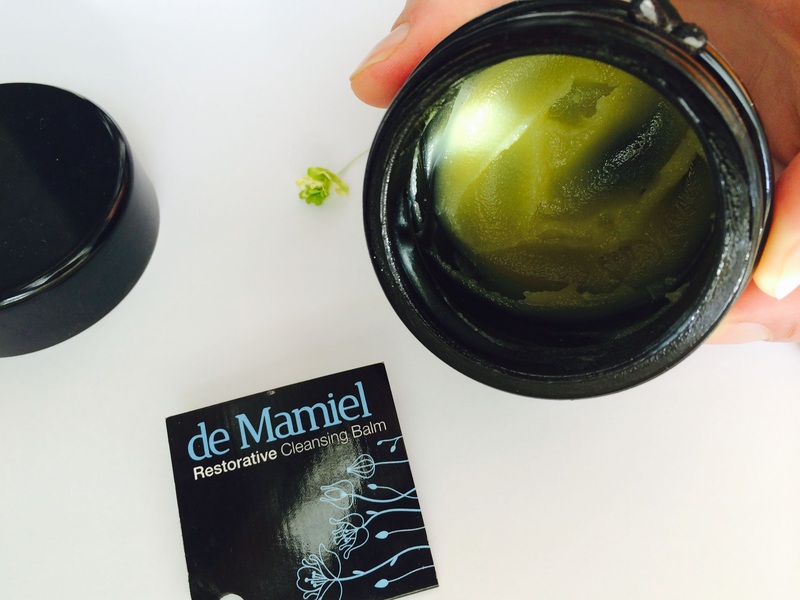 Have you tried this balm? What are your thoughts? If not, what’s your current favorite cleanser, balm or not? Ingredients: Camellia oleifera (camellia) oil*, Aleurites moluccans (kukui nut) butter, Calendula officinalis, Helianthus annuus (calendula) oil*, Squalene, Oryza sativa (rice bran) oil*, Borago officinalis, Tocopherol (borage) oil*, Polysorbate 20 (derived coconut oil), Cera alba (beeswax)*, Rosa damascena (rose) wax, Sclerocarya birrea (marula) oil*, Mangifera indica (mango) butter, Adansonia digitata (baobab) oil*, Moringa oleifera (moringa) oil*, Ricinus communis (castor) oil*, Astrocaryum murumuru (murumuru) butter, Theobroma cacao (cocoa) butter, Inulin, Alpha-glucan oligosaccharide, (prebiotic), Bisabol, Manuka honey, Daucus carrota (carrot seed) oil*, Melaleuca teretifolia (honey myrtle) oil, Agonis fragrans (fragonia) oil, Pelargonium graveolens roseum (rose geranium) oil*, Eriocephalus punctulatus (cape chamomile) oil, Rosmarinus officinalis (rosemary) oil*. Disclaimer: I purchased this from Shen Beauty over the phone, though Content Beauty also stocks this and has free international shipping. All thoughts and opinions are my own. This looks so good! I love the idea of a cleansing balm but have yet to try one. Do you think that cleansing balms are suitable for the summer? Or are they best during the dry months of winter? I read this review with a smile on my face because I use the same steps: de Mamiel cleansing balm followed by Yuli Halcyon. It is amazing for my skin and leaves it soft and leaves my happy. The two combined is wonderful! Wow the ingredients list is da bomb! I've not heard of applying probiotics on the skin but it sounds so magical and lethal! I absolutely love OLO skin savior balm; short ingredients list and my skin always feels great after, plus it's very multi-purpose! I will add this to my wishlist next time Shen Beauty has a sale, all of De Mamiel's products look amazing. One question, I am acne prone and I have to follow through balms/creams with another cleanser otherwise I break out. This has happened with May Lindstrom Honey Mud, Aurelia Cleanser, OLO, and the list goes on. I think my skin just needs the cleanser to completely wash off to be happy, is this something I can use by itself or should I invest in another cleanser to follow up? I think cleansing balms are suitable for all the time. I prefer them in the winter just because in the winter, I love lathering on a thicker balm to remove makeup after a dry and blustery day, while in the summer, I prefer something lighter or less fussy after a sweaty day. Definitely an appropriate case to use "glorious" in 🙂 Hope you try this balm first–it is a beauty (maybe on your next field trip to Content Beauty? :D). Thanks for reading! I hadn't heard much about applying probiotics topically to the skin until Aurelia launched, and then I was hooked. OLO Skin Savior is really nice and simple, also really nice scent; unfortunately I had a bad first experience with it, but I'm glad it's working well for you! Hopefully Shen Beauty will have another sale soon so you can pick it up! My skin sounds just like yours–it behaves much better when I double cleanse. I have always followed up with another lighter cleanser (typically YÜLI's Halycon) after this balm; you may have to do the same to be safe, but I suppose you may have to try it by itself to see if your skin is okay with it. Thank you! That is definitely true about oil and water. I find removing the balm cleanser with a warm, wet cloth tends to remove the left-overs quite well; plus I like to follow up with another lighter cleanser to make sure my face has been fully cleansed. Thank you Ana! It is pretty much perfect 🙂 Hope you give it a try soon! Thank you Jana! Ooh a DIY balm, very exciting! I'm curious–how did you make it? Oh I absolutely love how this sounds and looks, must try this myself! Their teas are also fab. I just discovered you just now through Ana's #FF and I love your write ups and pictures – I'll be checking back for sure ;-).